WASHINGTON (Feb. 11, 2009) -- Eight future, current and former Soldiers gathered on Capitol Hill Feb. 10 to offer insight and reflection on diversity in today's Army. The eight-person "Army Diversity Panel" met in the Rayburn House Office Building on Capitol Hill to discuss and take questions from members of Congress and their staff. 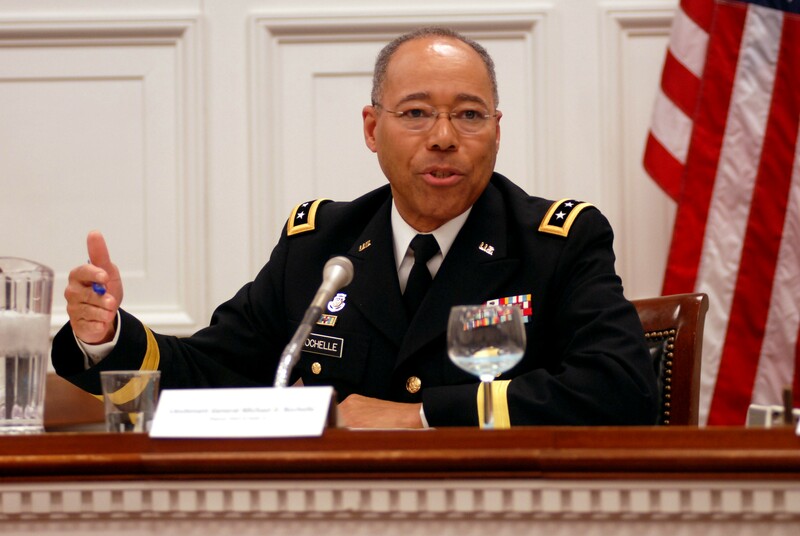 Lt. Gen. Michael D. Rochelle, deputy chief of staff, Army G-1, was one of eight former and current Soldiers who spoke on Capitol Hill, Feb. 10, as part of an Army Diversity Panel. The group discussed diversity issues in the Army today and took questions from members of congress and staffers. Included among the panelists were Brig. Gen. Belinda Pinckney, director, Army Diversity Office and Lt. Gen. Michael D. Rochelle, deputy chief of staff, Army G-1. Rochelle said his inspiration for joining the Army, despite his father being a Navy Chief Petty Officer, was actually his uncle, "a romping, stomping airborne infantryman from Korea." "He had me doing parachute landing falls in the backyard as a 5- and 6-year-old," Rochelle said. "He said something to me, though, that he probably would never remember having said. He said in order to be respected as being good, you have to be twice as good. I remembered that." The general conceded that his uncle's reference for how hard African-American Soldiers in the U.S. Army must work to be recognized was dated -- it was the 1950s then. "I did find that, no kidding, that I had to be just about twice as good to be respected as being good," Rochelle said, after having entered the Army himself in the early 1970s. "But that has dissipated over the years. It has dissipated because those who have gone before us have paid prices to allow us therefore to stand on their shoulders." The Army still has room to grow in terms of diversity, said Pinckney. Today, the number of African Americans and other minorities in senior officer positions does not yet match that of the overall American population. This, she said, is something the Army is working on through a human capital strategy that includes looking at accessions, retention and mentoring strategies in the service. "The chief of staff of the Army and the secretary of the Army would like to see, when we look up, when people look up, diverse representation at all levels," she said. "That is why I say we have work to do in that area. The end game is when we stop talking about it and it becomes a way of life -- we're not there yet." In addition to generals Rochelle and Pinckney, the panel included cadets David White and Nichole Myers from West Point; Brig. Gen. Arnold Gordon-Bray, deputy commanding general, U.S. Army Cadet Corps; retired Brig. Gen. Leo A. Brooks, the Boeing Company; 1st Sgt. Steven J. Colbert, the Old Guard; and retired Master Sgt. Mark "Ranger" Jones, president, the Ranger Group.